A couple of MIT students came up with an interesting idea and developed the Cineskate Portable Tripod Dolly. The wheels that they developed attach to the GorilliaPod tripod for DSLR’s and thus allow for slow tracking shots and smooth rotation. 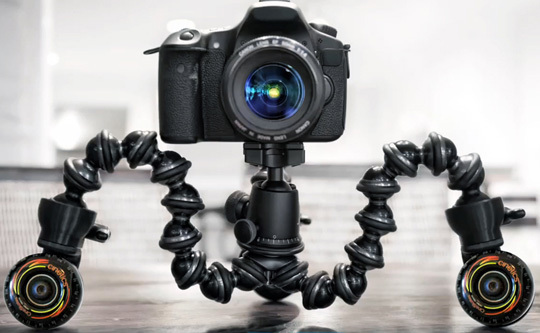 For $275 you get the full kit including the GorillaPod Focus and the ballhead. $150 just gets you the little skates. The project is now up on Kickstarter and and if you believe in the idea or would want to use something like this, you can support it here. This entry was posted on August 26, 2011 by cosmonavigator. It was filed under Gadgets and was tagged with 2011, alternative, august 26 2011, Cineskates Portable Tripod Dolly, cosmo, cosmo navigator cosmonavigator, cosmonavigator, current events, dailies, Design, funny, gallery, great, life, Life Style, media, news, nice, opinion, opinion photography, photo, photography, silence, thoughts, watch.